Hillary Faye is here to hold a space of love and compassion that will help you relax into wholeness, while offering you powerful tools and practices to experience and embody your innate love and wisdom. 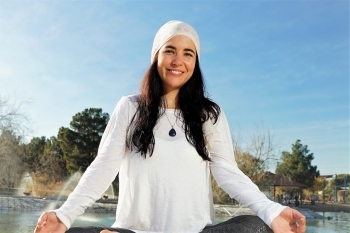 Hillary is an international Kundalini, Hatha and Vinyasa Yoga Instructor, Reiki Master and creator of the Awaken Love Registered Yoga School. Empower your yoga practice with Universal Life Force Energy. Reiki is a Japanese technique for stress reduction and relaxation that promotes healing. Learn how to give a Reiki treatment to yourself and others! Receive a comprehensive manual, a printed certificate and an attunement—which supports you in integrating and embodying the light that you are. Alchemy is the art of transformation and this workshop will help you access your multidimensional reality through yogic science in a grounding and expansive way. Learn about and experience the nine dimensions and how to access them through yoga and meditation. Learn powerful tools to help you feel better, ground, clear and call in energy. Learn how to create a triangle of well-being around yourself using living, vibrational words. We will end in a long savasana where you will be guided to activate your Soul Star Chakra for clearing and expanding your energy. Learn how to live, practice and teach more intuitively utilizing the best of Yogic Science, Kundalini Yoga, Alchemy, Reiki and more. Learn the Clair’s and how to enhance your own ways of picking up intuitive nudges as well as how to listen from your heart to access deeper wisdom and guidance. Learn more about what is really means to be an empath and what an empowering gift it can be with the right tools and support with this tailored yoga practice for energetically sensitive souls. The workshop provides you with powerful Kundalini Yoga and Alchemy tools and practices to support you in discerning which is your energy and which is someone else's; techniques for clearing and healing energy; and how to call in pure high vibrations of light. Learn how to move Universal Life Force Energy beyond space and time and bring deeper healing where it is most needed, whether in the past, present or the future. Learn the mental/emotional healing technique and how to infuse your yoga practice or classes with this energy of love. You will receive a comprehensive manual, a printed certificate and an attunement—which supports you in embodying more love energy and wholeness on all levels. Completed Reiki Level I is required.